We do struggle here in Thailand to find some ingredients that we need to make decent Indian food, kasuri methi (dried Fenugreek leaves) being one of them. I spot a couple boxes of kasuri methi in our local Macro the other day. I am not sure if they had only brought in the two to see if they would sell, or they originally had more, which they had already sold, but I was tempted to buy both. In the end, I only bought the one box, as the 'sell by' date wasn't that good and actually we only ever use a little in each dish. We had friends round to our place last night and cooked four different Indian dishes, besides nan breads and rice, one of those dishes being Dal Makhani. Like most good Indian food, the preparation is long and labour intensive. You have to soak your red kidney beans and black urad dal over night, then the actual dishes has about a dozen different ingredients and spices, and is finished off by adding lashes of cream and butter. The end result, however, is worth it, though maybe not that good for the waistline. 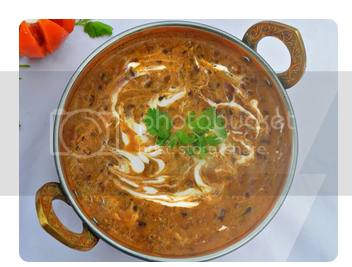 Personally, I think dal makhani is the king of the dals; fabulous.